Only a few genetic changes are needed to spur the evolution of new species—even if the original populations are still in contact and exchanging genes. Once started, however, evolutionary divergence evolves rapidly, ultimately leading to fully genetically isolated species, report scientists from the University of Chicago in the Oct 31 Cell Reports. 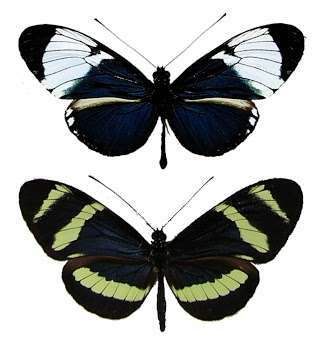 "Speciation is one of the most fundamental evolutionary processes, but there are still aspects that we do not fully understand, such as how the genome changes as one species splits into two," said Marcus Kronforst, Ph.D., Neubauer Family assistant professor of ecology and evolution, and lead author of the study. The researchers found that this regular gene flow mutes genetic variants unimportant to speciation—allowing them to identify key genetic areas affected by natural selection. 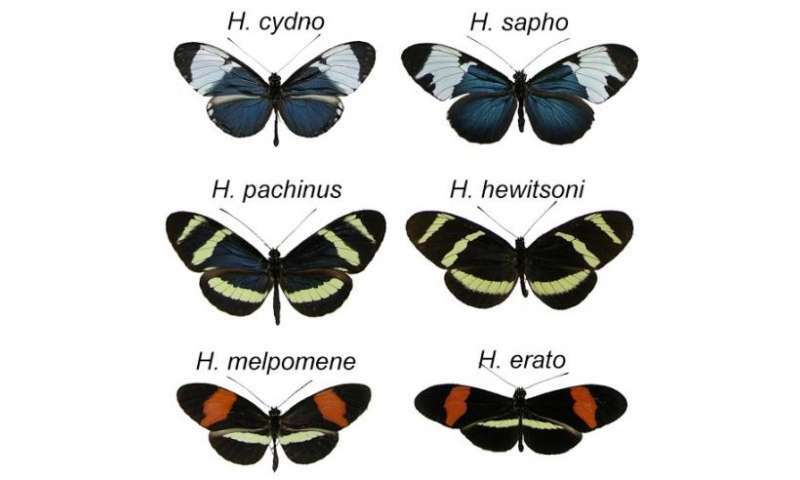 The butterfly species, they discovered, differed in only 12 small regions of their genomes, while remaining mostly identical throughout the rest. 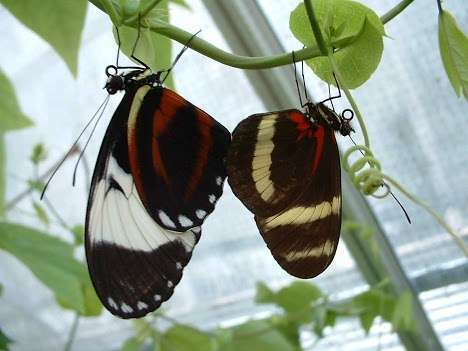 Eight of these coded for wing color patterning, a trait important for mating and avoiding predation, and under intense selection pressure, while the other four remain undescribed. "These 12 spots appear to only function well in the environment their species occupies, and so are prevented from moving between gene pools, even though other parts of the genomes are swapped back and forth," Kronforst said. So much for equalization of human races. I wonder how many generations it takes before a population starts developing different traits. Will someone with graphics capabilities help address this issue by replacing "Hybridization" in frame one of this graphic with "Mutation" and change frame two with a picture of a snake in a tree attempting to ingest a monkey? That would be one way to graphically illustrate for comparison the snake-centric theory of human brain evolution via predation. Frame four could also be replaced with a picture from what is now central China that compares the physical traits of the adaptively evolved human population that arose during the past 30,000 years to those of any monkeys found in the trees of the same region.